Humanitarian emergencies often increase the risk of transmission of communicable diseases, resulting in increased morbidity and mortality, particularly from outbreak-prone diseases. To address this increased risk, WHO and its partners established the Early Warning Alert and Response Network (EWARN), a simplified disease surveillance and response system that focuses on early detection of and rapid response to outbreaks or unusual health events. This evaluation protocol has been developed to provide guidance and standardized methods to ministries of health to evaluate EWARN implemented in countries of WHO's Eastern Mediterranean Region. There is compelling evidence of the direct relationship between salt consumption and blood pressure. WHO is coordinating initiatives globally to reduce dietary salt intake at the population level. Fundamental to this initiative is for countries to estimate a baseline of population-level dietary salt intake, and from there, to monitor trends in intake and the effectiveness of any interventions within and between populations. This document provides an essential salt intake measurement tool for countries in the Eastern Mediterranean Region that want to start, contribute to and share information on dietary salt reduction initiatives. 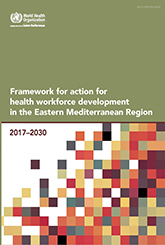 The Framework for action for health workforce development in the Eastern Mediterranean Region has been developed in response to the health workforce challenges facing the Region and in recognition of the need for countries, in line with Sustainable Development Goal target 3.C to increase the recruitment, development, training and retention of the health workforce. 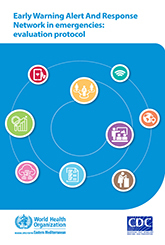 The framework, which builds on the Global strategy on human resources for health: Workforce 2030, aims to guide country and regional action to strengthen the health workforce to ensure access for all people to an adequate, competent, well balanced, motivated and responsive health workforce which contributes to health systems strengthening and progress towards universal health coverage in the Region.